This is a product that I can personally endorse. I actually own this Progressive chopper and it works really well. I use it at least four times a week to make a sort of modified Israeli salad (we really like Israeli salad). Once I get the vegetables cleaned, I can literally cut up a mixing bowl full of salad in under five minutes. I also use it for cutting soup and stew veggies, salsa ingredients, etc.. It's a fantastic kitchen tool and it can certainly be used for more than onions. I also have a separate one that I use for Passover. The downside? Depending on how often you use it, it does need to be replaced every four or five years. The blades do dull (and there's really no way to sharpen them) and the plastic will eventually start to crack after a few years of slamming. I think that's a good lifespan for a kitchen tool that I use almost daily. By the way, the entire thing goes right in the dishwasher (top rack) when you're done with it. I've never seen it for less than $14.00 on Amazon. 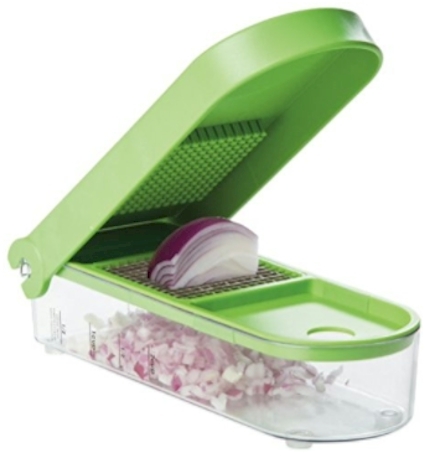 Amazon has currently got the Prepworks by Progressive Onion Chopper for $10.50 with free Prime/SuperSaver shipping.